A survey has been conducted as a part of the launch of the "Sydney Wildlife World’s Dangerous and Deadly Trail", to determine the level of awareness of Aussies when it comes to the country's deadly wildlife. The results of the survey are quite chilling - most Australians are unable to identify a dangerous spider or snake (22% of men surveyed said that they can identify a dangerous snake, whereas only 6% of women can recognize one by sight). This really presents a concern, when down-under is home to the world’s most deadly spider and boasts five of the top ten deadliest snakes on the planet. Furthermore, the survey results indicate that 73% of Australians have personally encountered a snake. 30% have been bitten by a spider. Time for some serious education, I think!! This underwater snail has a tooth-like stinger which acts like a harpoon. It has enough venom to kill a human as it paralyses the respiratory muscles. The cone snail's shell is pretty and colourful, so tourists often unknowingly pick them up. The most venomous fish in the world, the stonefish is not aggressive, however its proximity to shores and ability to camouflage itself in coral makes it easy for people to accidentally touch or brush against. It has 13 dangerous spines and a dorsal fin, and when humans are stung it causes death to tissues. 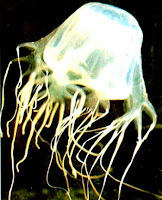 This jellyfish has a venom that attacks a human's cardiac and nervous systems and if it stings you, you have virtually no chance of surviving unless treated straight away. It's tentacles have the ability to sting even when separated from the jellyfish, making it a very dangerous creature. The tiny octopus changes from a muddy orange colour to a vibrant blue when it strikes. 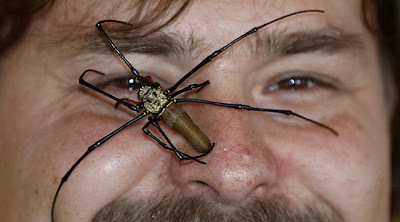 It has venom 10,000 times more toxic than cyanide and can kill in 90 minutes. The size of a golf ball, its beak can penetrate a wetsuit. With a jaw this size the crocodile doesn't need venom. The largest reptile in the world, it is fiercely predatory and has the ability to keep its body concealed underwater until it's ready to strike. This spider hides in the dark corners of back sheds, wardrobes and gardens. It's venom blocks nerve impulses, causing severe pain, vomiting, muscular weakness and sweating. The funnel-web sets up a trip-wire so it knows when prey is passing by, and its venom can kill a human in 15 minutes. The tiger snake's venom contains neurotoxins which attack the nervous system, paralysing the muscles and causing asphyxiation. Anti-coagulants also in the venom causes heavy, uncontrollable bleeding. Australian Bureau of Statistics data shows that 22 people died from snakebites between 1997 and 2006. The bite of a death adder causes paralysis and can kill in under six hours. If you're unlucky enough to step on one you've very likely to be bitten, with the death adder having the fastest strike of any Australian snake at a quater of a second. The taipan snake's venom is one of the most potent of all snake venoms. They generally stay away from humans but defend themselves fiercely if cornered or threatened. It typically attacks repeatedly, injecting as much venom as possible into the victim's body. This is in contrast to most snakes, who typically flee after attacking. Where: The common taipan is found in the far north of the country, Queensland, the Northern Territory and Western Australia. The second most venomous snake in the world, the eastern brown is responsible for the most deaths by snakebite in Australia. In 2007 a 16-year-old boy and nine-year-old girl died after being bitten by eastern brown snakes. Where: Its tendency to stay close to homes makes it one of the most common snakes humans encounter. The world's largest predatory fish, a typical specimen weighs between 700kg and one tonne and is 4 to 5 metres long. Attacks on humans are rare, but few survive an encounter. On average there are 15 shark attacks a year in the nation, with about one death each year. I like it, now I know not to step on a snail or pick up that blue circled octopus while trying to get away from the great white shark! It is good to know about these beasts but the number of people killed is very low, more people get killed by cars. So don't let it keep you from taking a trip and seeing the world! Thanks for the post.